Department of Medicine and Therapeutics, The Chinese University of Hong Kong, Shatin, Hong Kong. We thank Haroon, et al for their comments1. Their study demonstrated suboptimal performances of established cardiovascular (CV) risk scores in identifying asymptomatic coronary artery disease as confirmed by coronary computed tomography angiography (CCTA) among patients with psoriatic arthritis (PsA). The results were in line with our study based on carotid subclinical atherosclerosis2. However, they found that a multiplication factor of 1.5 accurately categorizes PsA patients as having a high risk of CV diseases, presumably based on the presence of coronary atherosclerosis. To address whether this also applies to our cohort of patients with PsA, we have performed posthoc analyses by calculating the risk scores and evaluating the performances in our published CCTA study3. Eighty-eight patients [age 50 ± 11 yrs; male: 54 (61.4%)] were included in the analyses. Demographics and clinical characteristics are described in Table 1. Eighty-four, 74, 88, and 88 patients were eligible to calculate Framingham risk score (FRS), the Atherosclerotic Cardiovascular Disease (ASCVD) score, QRISK2, and the Systematic Coronary Risk Evaluation (SCORE), respectively. Thirty-eight (45.2%), 23 (31.1%), 6 (6.8%), and 1 (1.1%) patients were classified as having high CV risks according to FRS > 10%, ASCVD > 7.5%, QRISK2 > 20%, and SCORE > 5%, respectively. After applying the European League Against Rheumatism (EULAR) multiplication factor, 51 (60.7%), 32 (43.2%), 22 (25%), and 4 (4.5%) patients were reclassified as having high CV risks, respectively. Overall plaque (P+) and mixed plaque/noncalcified plaque (MP/NCP+), identified by CCTA, were used to confirm coronary atherosclerosis. Fifty-three patients (60.2%) were P+ while 47 patients (53.4%) were MP/NCP+. In the P+ group, 56.9%, 40.4%, 9.4%, and 1.9% patients were identified as having high CV risks according to FRS > 10%, ASCVD > 7.5%, QRISK2 > 20%, and SCORE > 5%, respectively. 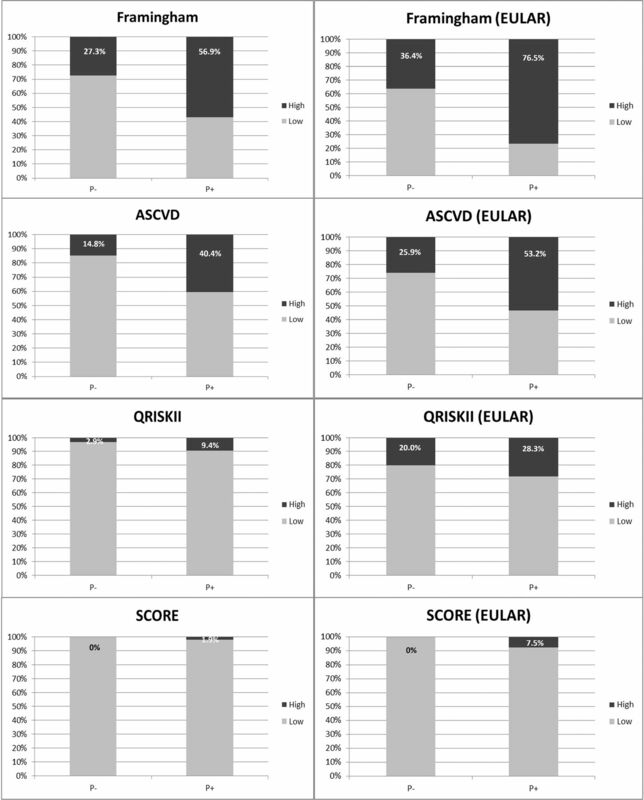 By applying the EULAR-recommended modification to the scores, the identification rate increased to 76.5%, 53.2%, 28.3%, and 7.5%, respectively, in the P+ group (Figure 1). In the MP/NCP+ group, 53.3%, 41.5%, 10.6%, and 2.1% were identified as having CV risks, respectively. After modifying the scores, the identification rate increased to 75.6%, 53.7%, 29.8%, and 4.5%, respectively, in the MP/NCP+ group (Figure 2). Left: Original risk scores. 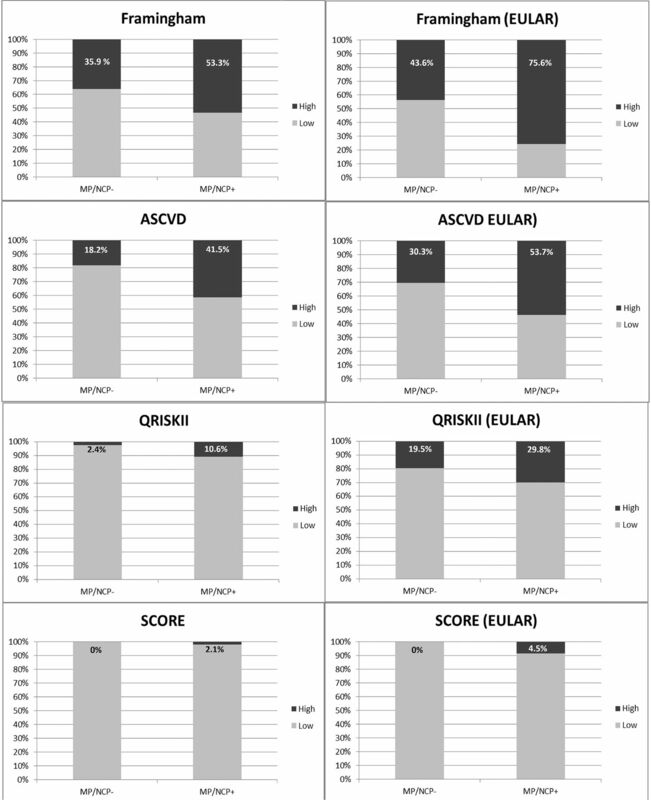 Right: EULAR-modified risk scores (overall plaque). EULAR: European League Against Rheumatism; ASCVD: Atherosclerotic Cardiovascular Disease (score); SCORE: Systematic Coronary Risk Evaluation. Left: Original risk scores. Right: EULAR-modified risk scores (mixed plaque/noncalcified plaque). EULAR: European League Against Rheumatism; ASCVD: Atherosclerotic Cardiovascular Disease (score); SCORE: Systematic Coronary Risk Evaluation. Demographic and clinical features of plaque− and plaque+ patients. Values are presented as n (%) or mean ± SD. Overall, Haroon’s result was in line with our own data and indicated that the performances of the original risk scores were poor, and the EULAR-recommended modification moderately improved the performances of these risk scores in categorizing patients with PsA at higher risks of coronary atherosclerosis. Our data also support using a similar multiplication factor of 1.5 in patients with PsA to improve the performances of CV risk scores. This work was supported by the Health and Medical Research Fund (No. 01120496).
. Modifications of cardiovascular risk scores, but not standard risk scores, improve identification of asymptomatic coronary artery disease in psoriatic arthritis. J Rheumatol 2018;45:1329–30. Underestimation of risk of carotid subclinical atherosclerosis by cardiovascular risk scores in patients with psoriatic arthritis. J Rheumatol 2018;45:218–26. Increased prevalence of coronary plaque in patients with psoriatic arthritis without prior diagnosis of coronary artery disease. Ann Rheum Dis 2017;76:1237–44.